Red Barrels confirmed it is working on Outlast 2, the sequel to the first-person survival game that launched a year ago. Red Barrels has another horror game left in it, and that game is Outlast 2, the developer confirmed in an interview with Bloody Disgusting. Red Barrels co-founder Philippe Morin explained Outlast 2 will take place in the same universe with different characters and a different setting. Morin said the 12-person indie team may make a game that revisits Mount Massive Asylum, the setting of Outlast, but that won't be the case for Outlast 2. "We have new ideas and themes we'd like to explore and we think we're cooking up something special," Morin said. 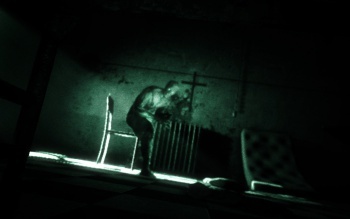 Morin chose not to confirm whether Outlast 2 will tie into the events at Mount Massive Asylum, choosing to keep the story of the sequel a secret as a part of mystery of horror games. Morin also did not answer questions about the mechanics for the sequel or whether players will be fighting a monster or fleeing from a monster. "Our goal is to give players first and foremost an emotional ride, so every design decision will be based on how it affects the experience and if it serves it," he said. "We really want to keep on improving our craft, but ultimately we'll approach things the same way we did with the first game, which was to make a game we're scared to play ourselves and trust our instinct." Outlast first launched on PC in September 2013, later coming out on PS4 in February and on Xbox One in June. The Whistleblower DLC released in May.